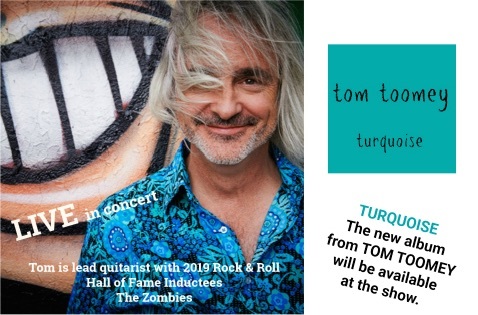 In addition to Tom being the lead guitarist for legendary band The Zombies (‘She’s Not There’ etc…), he also writes, produces, plays and tours as a solo artist. His music includes work with The Monficats, Jingo Santana, solo electric guitar and solo acoustic shows. Albums include ‘Iron on Stone’, ‘Monficat’, ‘Gambia’, ‘Echo Bridge’, ‘Ghost of You and Me’ (Colin Blunstone),’Breathe Out Breathe In’, ‘Live in Uk’, ‘Metropolis Sessions’, and most recently ‘Still Got That Hunger’. There are quite a few other albums as well (Google him!!). Toomey has also worked with (live or in the studio): Don McLean, Jon Anderson, Sir Cliff Richard, Leo Sayer, Paul Young, Gene Pitney, Marc Almond and quite a few other fabulous artists.